I love Spring! It's one of my favorite seasons. Bright, beautiful colors. Clean air. Optimism. Everything is fresh, new and full of potential. I also love the fragrances the arrive in the spring. Delicate florals. Dewy grass. Clean water. 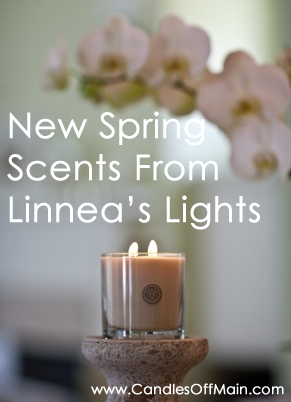 Linnea's Lights created 3 new fragrances to celebrate the arrival of spring: Persian Lime, Eucalyptus and Geranium. Each fragrance is distinct and on-point, as are all the scented soy wax candles by Linnea's Lights. Effervescent citrus blend of tart lime, grapefruit and vetiver. I'm not usually a fan of lime fragrances, but this one is wonderful! The grapefruit really comes through for me and creates a great citrus blend. I highly recommend the Linnea's Lights Lime candle if you like lime, grapefruit or other citrus fragrances. This candle would blend well with other citrus scents such as Linnea's Lights Grapefruit, Aura Clairvoyant or Nest Grapefruit. Linnea's Lights Persian Lime would work very well in a kitchen or bathroom for a fresh scent. Cool eucalyptus warmed with pacific woods and fresh air. I love this eucalyptus candle by Linnea's Lights. It's very well balanced with fresh eucalyptus and soft woods. Sometimes eucalyptus can be very medicinal (think Vick's Vapor Rub) with a strong menthol scent, but this one is slightly muted by the soft woods without losing the essence of eucalyptus. This candle is very unisex and would work well for men and women. Great for bathrooms. Soft rose geranium blended with uplifting bergamot and clary sage. I love Rose Geranium and this candle is a fantastic representation of this beautiful scent. It's cheerful, uplifting, youthful and vibrant. Linnea's Lights Rose Geranium would blend well with another rose candle or a grapefruit or bergamot candle to compliment the notes in this fragrance. This bright floral would work well in just about any room. Other candles I would recommend to go with this one would be Votivo Rush of Rose, Aura Clairvoyant, Linnea's Lights Grapefruit and/or Tocca Florence. These new fragrances offer a great opportunity to try Linnea's Lights candles if you haven't already. Whether you like citrus, floral or neutral tones you'll be able to find the scent to suit your preference and mood. You can't go wrong with any of these three new scents or any of the other scented candles by Linnea's Lights. What is your favorite spring fragrance? I love the candle "Fylingdales" by maison Emmanuel Galea Paris , it smells powdery Iris and violet leaf .. A very nice spring candle to me.